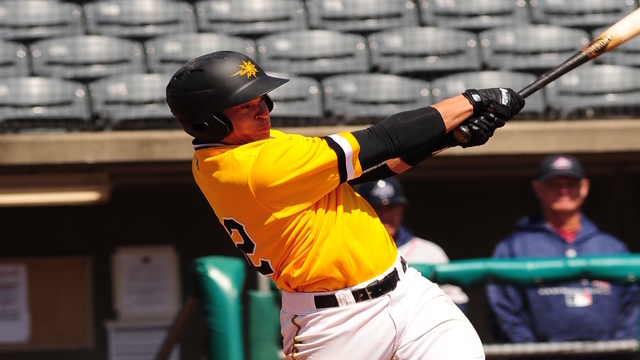 HICKORY, N.C. (April 14, 2018) - After squandering an early four-run cushion, the Power exploded for seven runs in the ninth inning to stun the Hickory Crawdads, 15-11, on Saturday evening at L.P. Frans Stadium. Deon Stafford's two-run double ended up marking the difference in the comeback win. Trailing by three runs entering the final frame, West Virginia would not go away quietly against Hickory reliever Grant Zawadzki (0-1). Chris Sharpe led off the inning with a single and quickly moved to third on a wild pitch and a single from Calvin Mitchell. Dylan Busby then drove him in on a line drive to center field that shrunk the deficit to 11-9. Ben Bengtson, who entered the game in the fifth defensively for Mason Martin, worked a walk to load the bases against Zawadzki. Oneil Cruz then plated the second run of the inning with a force out at second base, bringing the Power down to their final out with the tying run 90 feet away. Stafford followed that up with his run-scoring double that brought in Busby and Cruz to give West Virginia a lead they would never relinquish. Kyle Watson succeeded Stafford's heroics with a two-run homer to left, his second of the season, and Sharpe finished off the seven-run inning with an RBI triple to bring in Ryan Peurifoy and put the score at its final 15-11 tally. After entering the game in the eighth, Blake Cederlind (1-1) slammed the door in the ninth as he struck out the side to complete the comeback victory. West Virginia (5-5) jumped out to their early 4-0 lead through their first two offensive frames against Hickory (1-8) starter A.J. Alexy, as Martin started the scoring in the first with a towering two-run blast that cleared the three-level sign wall at L.P. Frans Stadium to give the Power a 2-0 edge. West Virginia doubled that total an inning later on an RBI single from Rodolfo Castro and a passed ball that scored Sharpe. Hickory's offense awakened in the bottom of the second, however, as the Crawdads plated four runs in that frame before tacking on three more to take a 7-4 lead. 17 men came to the plate against Power starter Ike Schlabach across those two innings, with Kole Enright kicking things off with an RBI double before Eric Jenkins laced a two-run triple and promptly scored on a double from Justin Jacobs. The Crawdads kept the scoring alive in the third, as Tyler Ratliff, Pedro Gonzalez and Ryan Dorow stroked three straight singles to begin the inning before Enright lofted a sacrifice fly to center and Chad Smith drove in Gonzalez with a groundout. Three batters later, Melvin Novoa grounded a slow roller to Cruz, who could not handle the ball cleanly, allowing Dorow to trot home and make it 7-4 Hickory. In the fourth, West Virginia clawed the deficit to within one as Watson ripped an RBI triple to center, scoring one batter later on a wild pitch from Alexy. The Crawdads would respond in their half of the fifth, however, as Hickory scratched across three more to make it 10-6. Castro would slim that margin to two with a two-run triple in the sixth off Crawdads reliever Joe Kuzia, but Hickory would retaliate with another run in the seventh to cap their scoring in the contest. West Virginia concludes its four-game series with the Hickory Crawdads on Sunday afteroon at L.P. Frans Stadium. LHP Braeden Ogle (0-0, 9.00 ERA) toes the rubber for the Power against Crawdads righty Reid Anderson (0-1, 0.00 ERA). First pitch is set for 3:00 p.m., with pregame coverage beginning at 2:40 p.m. on The Jock 1300 and 1340 AM, as well as online at wvpower.com and via the TuneIn Radio App and the MiLB First Pitch App. The Power return home on April 19 for an eight-game homestand against the Asheville Tourists and the Rome Braves, with tons of promotions on tap, including another Thirsty Thursday, presented by Rock 105, a postgame fireworks show, presented by Electric 102.7, and Brewfest CharlieWest on Saturday with a 2:05 p.m. first pitch, sponsored by Rock 105. Our first Pets in the Park is on April 25, while Family Buck Night returns on Monday, April 23. For tickets and more information, call 304-344-2287 or visit www.wvpower.com.